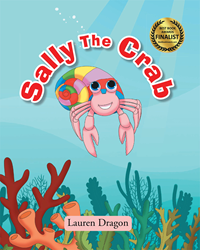 “Sally the Crab” from Page Publishing author Lauren Dragon is an enamoring children’s story that delves into the themes of friendship, acceptance, and love. “Sally the Crab” was released last fall and has since then been a finalist in a national book competition. The Best Book Awards originally launched in 2003 and covers books from all sections of the publishing industry. The awards are specifically designed to garner publicity and attention to the books for readers to become aware of stories worth reading. Sally is a hermit crab with a beautiful, colorful shell that is admired by many. However, Molly is her best friend. But one day Molly has to move far away and shortly after this, Sally outgrows her shell. She must then go on a search for another one, but realizes looking for a new shell is not as easy for a crab as one might think. Will Sally and Molly ever see each other again and what kind of encounters will Sally come across along her search for a new home? “Sally the Crab” is also in the process of receiving a high rating from the Reading with your Kids Podcast (RWYK), which will be announced late this month or next. Follow this graceful crab as she ventures on a journey to find a new home and environment. Enjoy the bonus coloring and drawing pages at the end of the book as well!